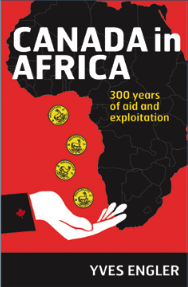 Mainstream academics and journalists like to portray Canada as a positive force on the international stage, but Yves Engler’s new book, Canada in Africa, shows how frequently Canadian governments and corporations play a destructive role abroad. In Africa, Canada’s government and mining companies have together or separately aided genocide in Rwanda and the Democratic Republic of the Congo (DRC), been complicit in overthrowing and killing elected leaders, helped massively increase poverty, destroyed many communities and the environment, as well as spread corruption and abetted slavery. Engler’s well-researched text explains how the Canadian elite profited from the transatlantic trade in African slaves, and details Canada’s significant support for British colonialism in Africa, before presenting a damning portrait of Canadian neocolonialism on the continent today. This historical perspective is useful for discovering important facts about Canada-Africa relations, as well as for learning more about the true nature of the Canadian ruling class. “Much of the capital used to establish the Canadian Imperial Bank of Commerce came from supplying the Caribbean slave colonies [during the 18th and 19th centuries],” writes Engler. Since then, Canada has behaved as a sub-imperialist power in Africa, playing a junior but important role first in British then U.S. imperial policy toward the continent. Part of the significance of Canada’s role is its dominance in Africa’s mining sector. According to Engler, Canada is the leading international resource investor in the continent. Half of all foreign mining companies in Africa are Canadian, operating 700 mineral projects, worth over $31 billion, in 35 countries. Protection and expansion of these corporate investments is what primarily motivates Canadian policy toward Africa, says the author. Contrary to Canadian government assurances, mineral development is not enriching those parts of Africa where it occurs. Dependence on selling raw minerals has deindustrialized parts of Africa, and low royalty rates and taxes ensure there is little capital returned to state finances, while corporate profits are returned to western banks. Ottawa has actually shaped the mining codes of eight African countries resulting in lower royalties. The World Bank and International Monetary Fund’s (IMF) neoliberal structural adjustment programs (SAPs) imposed on African countries (with Canada’s strong backing) also emphasized increasing raw material exports, privatization, and cutting health and education budgets in exchange for international loans. Canadian “aid” to African countries is frequently conditional on carrying out SAPs, and sometimes linked to working with Canadian mining companies. To insure against changes in national policy down the road, Ottawa has signed 15 Foreign Investment Protection Agreements (FIPAs) that grant mining firms the right to sue African countries for reduced profits. The space for democratic governance and non-resource-based forms of development is severely constrained by these investment treaties. The looting of a continent’s resources requires not just economic muscle but military power as well, and here, too, Canada’s role is extensive if less well known. Canada’s military has trained hundreds of African soldiers, its naval vessels patrol Africa’s coast (as part of NATO), and Ottawa has spent hundreds of millions of dollars building the military capacity of the African Union (made up of 54 countries) and “developing a regional military structure to police the continent.” Canada is also trying to get military bases in Kenya, Senegal and Tanzania. Canadian military involvement in the last century proved useful for removing popular, progressive and nationalistic African leaders who wanted to use their country’s resources for the benefit of their people. Africa’s two most renowned examples of such leaders are Kwame Nkrumah and Patrice Lumumba, both removed with Canadian support. Nkrumah, Ghana’s first elected president, was overthrown in a U.S.-backed military coup in 1966. The Ghanaian military at the time was being trained by Canadian Forces and Canada welcomed the dictators, lavishing aid on them. Nkrumah was hated by Washington for his independent streak and had called Canada “just another imperialist country.” The coup ensured that Canadian mining companies would be given open access to Ghana’s mineral wealth. Similarly, Canada helped to eliminate Lumumba, elected prime minister of the mineral-rich Congo (now known as the DRC) in 1960. Lumumba’s killing was plotted by the U.S. and Belgium, which used the prime minister’s Congolese rivals to execute him in 1961 with the connivance of the Canadian-dominated United Nations Mission sent, ostensibly, to help Lumumba. Engler provides a chilling account of the critical role played by Colonel Jean Berthiaume (deceased), the top Canadian in the UN Mission, “in directly enabling” Lumumba’s murder. Engler concludes that through activism, Canadians can be convinced to pay attention to their government’s sordid role in Africa as a first step towards changing things for the better. However, a few pages on how such activism could be organized or spread would have been very useful. Asad Ismi is the CCPA Monitor’s international affairs correspondent. He is author of the radio documentary « The Ravaging of Africa » which Black Agenda Report called « ground-breaking ». The documentary is based on his award-winning article of the same title and has been aired on 28 radio stations in the U.S. and Canada reaching 30 million people. For his publications visit www.asadismi.ws.